A Climate Realist’s (not so) short Answers to Hard Questions About Climate Change. Question 11 (of 16) Is crazy weather tied to climate change? – Len Bilén's blog, a blog about faith, politics and the environment. A Climate Realist’s (not so) short Answers to Hard Questions About Climate Change. Question 11 (of 16) Is crazy weather tied to climate change? Answers to Question 5. Will reducing meat in my diet help the climate? Justin Gillis answer to Question 11. Is crazy weather tied to climate change? Scientists have published strong evidence that the warming climate is making heat waves more frequent and intense. It is also causing heavier rainstorms, and coastal flooding is getting worse as the oceans rise because of human emissions. Global warming has intensified droughts in regions like the Middle East, and it may have strengthened the drought in California. In many other cases, though, the linkage to global warming for particular trends is uncertain or disputed. That is partly from a lack of good historical weather data, but it is also scientifically unclear how certain types of events may be influenced by the changing climate. Another factor: While the climate is changing, people’s perceptions may be changing faster. The Internet has made us all more aware of weather disasters in distant places. On social media, people have a tendency to attribute virtually any disaster to climate change, but in many cases there is no scientific support for doing so. My answer to Question 11. Is crazy weather tied to climate change? 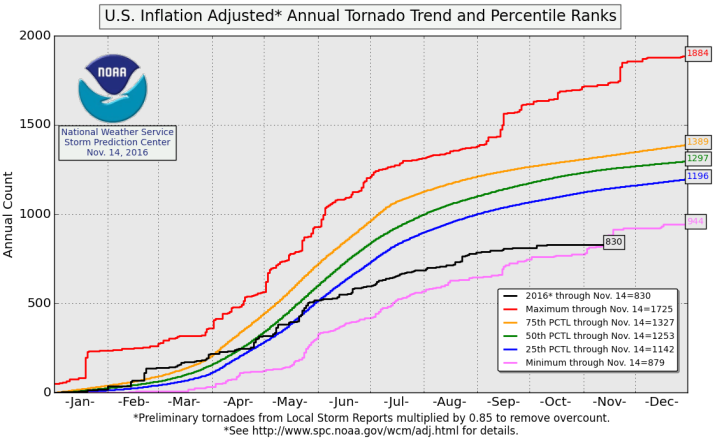 The tornadoes are declining. More CO2 means less temperature gradients causing fewer tornadoes. The Polar Bears will do quite well, their numbers have more than doubled in the last 50 years. The temperature regulator of the earth is working quite well, and the increase in temperature at the poles is welcome as it lessens the temperature gradient between the tropics and the polar regions, which in turn reduces the severity of storms, and tornadoes, since they are mostly generated by temperature differences and the different density of warm, humid and dry, cold air. What about ocean acidification? 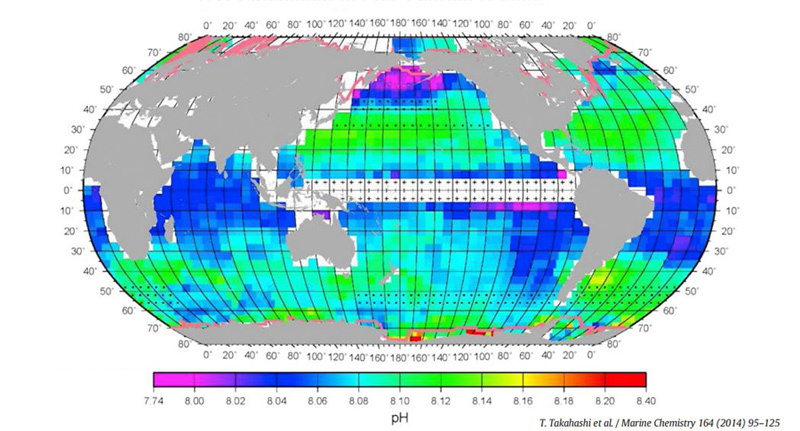 As CO2 increases, a lot of it will be absorbed in the oceans, thereby making the oceans more acid. This is true, but CO2 is a very mild acid and has a minor acidic influence. Of much more importance is acid rain. At one time in the 70’s some lakes in Norway had a Ph. of about 4.5, enough to kill most trout fishes. In Sweden it was said they fertilized their rivers and lakes four times as much as tilled soil, leading to significant acidification of both the Baltic and the North Sea. The Baltic Sea is still in danger of total oxygen depletion. By comparison to these dangers CO2 in the ocean is only a very minor disturbance. Clean the rivers and lakes first! Oh, and one more thing. The sea level rise is a natural phenomenon of tectonic plate movements, the Atlantic Ridge is rising and the Eastern Seaboard is sinking. These movements will continue to occur regardless of the climate. The increase in temperature is manageable and even desirable in most regions of the world, desert areas and areas prone to flooding being the exception. CO2 is a clean gas, necessary for life, and an increase in the amount of CO2 is highly desirable. The very minor increase in temperature is on balance beneficial, since it leads to a less violent climate, with fewer storms, hurricanes and tornadoes. 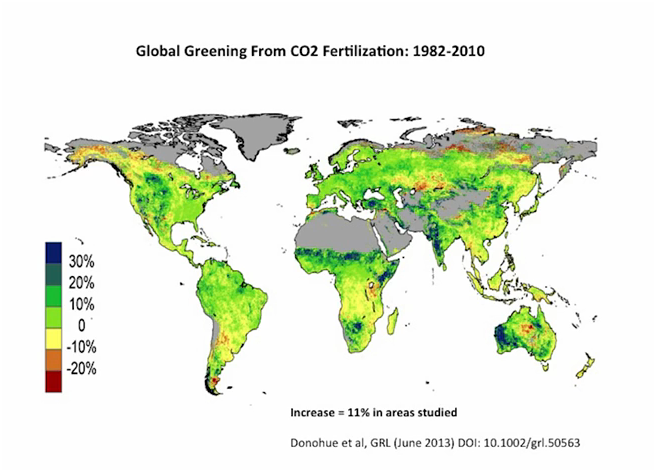 The increase in CO2 makes us able to feed another 2 billion people on earth, not to mention additional wildlife. Ocean acidification is a problem, not so much from CO2, but from sulfuric acid, nitrates and other pollutants. The major offender: China. The increase in precipitation is beneficial, except in areas already prone to flooding. It is especially welcome in arid areas. The chart below show no increase in heavy rains as CO2 increases. Coal can be converted to jet fuel and gasoline, air planes have no alternative fuels. Previous Previous post: A Climate Realist’s (not so) short Answers to Hard Questions About Climate Change. Question 10 (of 16) Why do people question climate change? Next Next post: A Climate Realist’s (not so) short Answers to Hard Questions About Climate Change. Question 12 (of 16) Will anyone benefit from global warming?